My kids are grown and gone. I’ve spoken of it many times here on my blog. I’ve admitted that I didn’t handle the empty nest thing very well…in fact, I’m still adjusting! Like many of you out there, life as I knew it changed the day I had my daughter. When my son came along, it was like God was shining his love down on me. I had these two beautiful, healthy children and felt incredibly blessed. I became a whole different version of myself. My children became my life’s work. In fact, they are my greatest accomplishment and will remain so until the day I die. I made this Mother’s Day printable for all of us who have devoted our lives to our children…and then let them go. It’s a hard thing to do. I look at my kids now and am filled with pride. I was NOT the perfect mother. Does such a thing even exist? But at the end of the day, I can rest easy knowing I did the best I could. Every sacrifice, every sleepless night, every dollar spent was worth it. The times I winged it, hoping I was making the right decision, didn’t seem to hurt my children at all. I know there were mistakes…but there are no do-overs in Motherhood. Hopefully I did enough things right to make up for the things I did wrong! Thank you to everyone who entered our For The Love Of France giveaway. 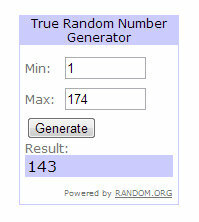 The winner is Kim from Living Vintage. Congrats Kim! I have a surprise coming on Monday that I am so excited about. I’ve hinted a little on my Facebook page and can’t wait to share the details with you. Happy Friday! Click to follow the Printables by OSP Pinterest board! Beautiful, beautiful quote. I’ve always said that no one loves you more deeply than your mother. When you lose your mom, my words will ring true. I still miss mine. Thank you for this print. I’ll print one for her album and one for each of my girls. I adore this quote! Thank you for sharing, Ann! All I can say in response to your comments in this post is….AMEN! I’ve been an empty-nester for many years, but my daughter is still my child! Happily, she gave me two grandsons, whom I adore, and try to see at least once a week; attending many school events and as many baseball games as I can. No matter how old your children are, you never forget all their special moments. Now I’m trying to enjoy my grandchildren’s special moments! “”There are no do overs in motherhood”” Amen Sister! lol But don’t you wish that you could impart your wisdom on someone younger?? there use to be this tradition of that within a family. I think this tradition has faded from our culture. Unfortunately, the next generation and the next will have to learn for themselves. Where do we grow if the same thing repeats itself without an adjustment? Ya know? Loved your thoughts today. Hugs. Thanks so much, Ann, I am going to definitely print this. I am nearing the empty nest, just one more left at home and I don’t do change easily! I’ve learned not to beat myself up over the things I did or didn’t do, I know my memories are more far reaching than theirs. And you need to focus your energy on the present and that’s impossible if you are constantly dredging up the past. If any mother thinks she ‘s perfect, she needs a reality check! Lovely post, Ann, and i had to save the printable! I think this would make perfect gifts for my daughters…very beautifully written. Thank you! Ann, I pinned your wonderful printable. I never had children of my own, but I try to compensate by being a good grandmother to my step-son’s children. Hope you have a wonderful weekend! Beautigul quote Ann. We are the parents of 4 children,the youngest a junior in college. Three are grown and on their own. I miss the them being home,but am satisfied they are leading happy productive lives. My husband and I do enjoy the empty nest,,, most of the time!! That satisfaction comes from a job well done! i feel the same way as you ann about the kids. mine are grown, last one in college. miss them but thankfully they come back to visit for a hug and food fairly often!!! two growing boys! Yes the visits are wonderful aren’t they? Gives me a great excuse to cook up a storm! Beautiful Ann, just beautiful. You made me smile from ear to ear..as I hope to say the same someday. But I don’t want the empty nest to come too soon, I will struggle with it, I know I will. Love your printable. I can relate to his post completely, I hope you are well, and have a wonderful weekend. What a beautiful saying and sentiment, Ann … thanks for sharing! And, can’t wait to hear your big news! Aww this makes me want to go wake up my baby girl and squeeze her! 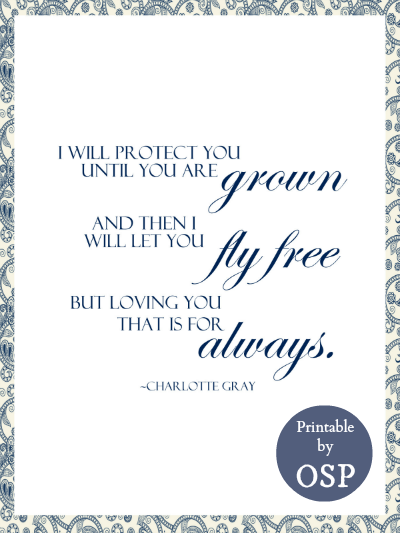 Beautiful quote and beautiful printable! My two daughters are grown now too – and I was a single mother for most of their lives – so I know I made many mistakes, too. I worked 70-80 hours a week and missed sooooooooooo much of the fun stuff. I hope one day to be a grandmother…..though it isn’t looking like it is going to happen………but I do hope to, so I can be part of a child’s life now I am finally retired enough to enjoy every step. I missed so so much of it the first time around. Love the downloadable- thank you. We have been blessed with seven beautiful grandchildren. They have kept us young in spirit and our doors are always open to them. Ann, My husband and I will be empty nesters in August for the first time when all 3 girls head off to college. This post was encouraging to read. It is going to be hard to let go. Enjoy these college years…I loved them! Ann, I could have written this post. My children were my life’s work as well. Thanks for the printable. This mother’s day all my children are coming home! YIPEE! Thanks for giving voice to how so many of us feel inside!